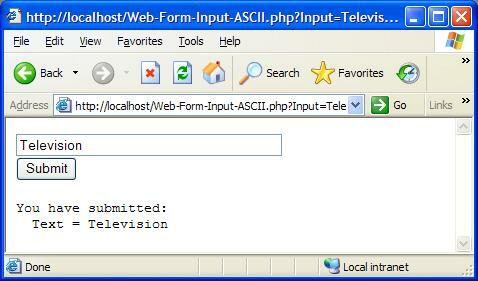 This section describes how to display a Web form and process form input data in ASCII. #- Copyright (c) 2005 HerongYang.com, All Rights Reserved. After moving this PHP script file to Apache server document directory, I tested it with Internet Explorer (IE) with this URL: http://localhost/Web-Form-Input-ASCII.php. I saw a Web page with a form that has the suggested input value and a submit button. After clicking the submit button, I saw a returning Web page with the same form and a reply section, which confirmed that the input text were correctly received by the PHP script.